Cooked salmon baked in parchment on a green olive, caper, caramelized onion and raisin sauce. It isn't everyday my dinner guests rate my entree. In fact, no one has ever rated anything I've ever served until they tasted these salmon packets. After scraping their parchment clean, my guests looked up and one of them said, "This dish is an 11." And everyone nodded in agreement. The salmon's texture is like velvet and the sauce is a little salty from capers and Castelvetrano olives and a tinge sweet from caramelized onions and raisins. I give it an 11 for taste, texture, ease of preparation and serving. No cooking technique is simpler than baking in parchment. The packets can be assembled ahead and there is no clean-up. The packets are even easy to tote to someone else's house. The most time consuming part of this dish is CARAMELIZING THE ONIONS. This takes about 30 minutes, during which time you can prepare the rest of your ingredients. Begin with a large yellow (also called brown) onion, because after the slices are caramelized they shrink to about one quarter of their size. I don't think you can caramelize too many. First cut the onion in half through the stem end. Peel and place one half cut side down. Cut into slices about 1/8 inch thick. If they are too thin, they shrink to almost nothing and get lost in the sauce. CASTELVETRANO OLIVES are the preferred olives for this dish. Their bright green color and sweet, lightly salty flavor is difficult to duplicate. Sometimes you are lucky enough to find them pitted in a supermarket olive bar, but if not, here's the easiest way to pit them. Lay them on a cutting board, top with wax paper and pound lightly so they split open. The pit is then easy to remove with your fingers. . THE SALMON: Wild salmon is always preferred, but whatever kind you buy, be sure it is center-cut fillets that are 1 to 1 1/4-inches thick and weigh 5 to 6 ounces each. Try to get them the same thickness so they get done at the same time. If one or two of them are thicker or thinner, put an X on the top of the parchment with a marker so you will know to leave it in the oven a couple of minutes longer or take it out a couple of minutes earlier. THE MENU: You can't serve much with the salmon because the parchment takes up most of the plate. I either serve it with asparagus or green beans on the side. For a first course I like a green salad, but soup would work fine, too. You can assemble the packets early the day of serving and refrigerate them. I give full credit to Bon Appetit magazine for this fabulous recipe which is from The Bazaar in Miami Beach, FL. Caramelized onion are deep golden with some slices very dark brown. Removing the pit from the olives by lightly pounding them. I use a meat pounder. Salmon and sauce In parchment ready to bake. Heat 2 Tbsp. oil in a large skillet over medium-low. Add onion, bay leaf, and a pinch of salt and cook, stirring often and reducing heat if onion is browning too fast, until onion is golden brown, 25–30 minutes. Add olives, capers, raisins, and 2 Tbsp. water to skillet and cook, stirring occasionally, until olives are softened, about 4 minutes. Add rum and cook until liquid is evaporated, about 5 minutes. Remove skillet from heat and stir in lime juice and 1 Tbsp. water. If needed, add a splash or two more of water so mixture is saucy; season with salt. TO MAKE AHEAD: Sauce may be refrigerated up to 2 days. Before using, add water to looen it if it looks dry. Season salmon with salt and pepper. Cut four large sheets of parchment paper. Working with 1 sheet, spoon one-quarter of sauce onto the center of paper; scatter 1 Tbsp. cilantro over. Create a well in the sauce the size of a salmon fillet and place fish in well; drizzle with oil. Gather edges of parchment up and over salmon and tie tightly closed with kitchen twine. Set on a rimmed baking sheet. Repeat with remaining parchment paper, sauce, salmon, and 3 Tbsp. cilantro. TO MAKE AHEAD: Packets can be refrigerated up to 8 hours. Remove from fridge 30 minutes before cooking. 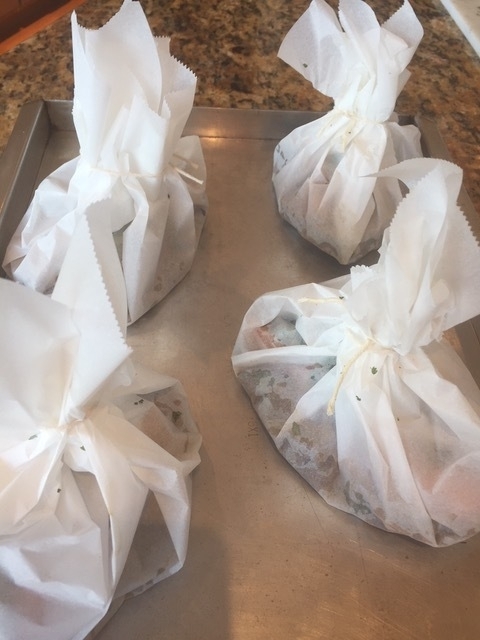 If packets have not been refrigerated, bake them until salmon is cooked through, 20–22 minutes for medium (bake 2 minutes longer for well-done). If cold, add 3 to 4 minutes to cooking time. Remove from oven and let salmon steam in packets 2 minutes. Unwrap and top with more cilantro. Serve with lime wedges for squeezing over.